Jerry Grey tagged with wrestler Bob Cook to form a newer version of the “The Mighty Yankees”…. 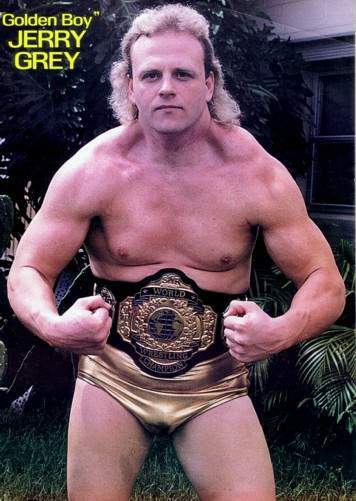 March of 1986: Jerry Grey defeated “Haitian Sensation” Tyree Pride to win the Florida Bahamas title..
September 8, 1987 in Tampa, FL: Jerry Grey & Bob Cook beat Mike Graham & Steve Keirn..
~~~Tom Prichard’s partner (and fellow Title holder) Brett Sawyer is injured; Grey is named the replacement partner..
June 3, 2006–World Pro Wrestling: Navajo Warrior & Killer Klown defeated Jerry Grey & Mighty Henrich Volkoff..
July 4, 2006–World Pro Wrestling: Jerry Grey & Mighty Henrich defeated The Ballard Brothers…. Jerry Grey is still very active running and wrestling on many shows all over the United States..
November 24, 2006–WPW: Mighty Henrich Volkoff & Doink beat Rick Steiner & Jerry Grey to win the Tag Team titles! March 17, 2007–World Pro Wrestling: Rick Steiner defeated Jerry Grey in a Barbed Wire Brass Knuckles match. July 4, 2007–World Pro Wrestling: Jerry Grey defeated Rico Santana in San Diego, California ..
September 1, 2007—WPW: Jerry Grey & Doink beat Navajo Warrior & Honky Tonk Man after HTM turned on Warrior..
July 6, 2008–World Pro Wrestling: Jerry Grey & Gino Santana beat Navajo Warrior & Mister X to retain the Tag Team titles..
July 6, 2008–World Pro Wrestling: Jerry Grey & Gino Santana beat Navajo Warrior & Hawaiian Lion to retain the Tag Titles..
July 6, 2008–World Pro Wrestling: Navajo Warrior & Shawn Riddik beat Jerry Grey & Gino Santana to win the Tag Team titles! January 7, 2009–World Pro Wrestling: Honky Tonk Man & Doink The Clown vs. Jerry Grey & Mighty Volkoff was a No-Contest..
Special thanks to “Golden Boy” Jerry Grey for emailing us and helping to complete this profile!